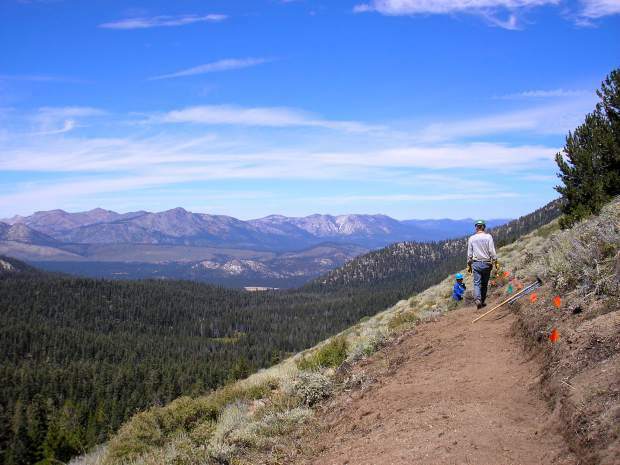 Volunteers spend thousands of hours each year maintaining the Tahoe Rim Trail and associated trails. If Lake Tahoe were a queen, the Tahoe Rim Trail would be the crown circling her royal head. Consisting of 165 miles of 24-inch, single-track trail, the Rim Trail offers some of the most breathtaking views of Big Blue and an experience that few other trails in the U.S. can rival. Its diverse ecology and scenery, spanning from arduous uphill climbs to pastoral meadows, along with its accessibility — there are 17 access points at various stages of the loop — make it a popular destination for hiking, horseback riding and mountain biking, the last of which is permitted on specific segments of the trail (motorized vehicles of any kind are not allowed on the trail). And although you won’t find it on top trail lists with the same frequency of say the Pacific Crest Trail — of which approximately 50 miles overlap with the Tahoe Rim Trail — or the John Muir Trail, the Rim Trail has become a destination for many seeking to take in the splendor of Lake Tahoe and the Sierra Nevada. To be more specific, trail counter data collected by the Tahoe Rim Trail Association, the nonprofit created to construct and maintain the trail, pegs the number of annual users around 400,000. “We have 400,000 people coming out and using the trail every year, and a lot of those folks are local and a lot of them are coming from … around the country, around the world even, to come to this world class destination,” said Morgan Fessler, executive director of the Tahoe Rim Trail Association. Regardless of where they’re from, it’s a sizeable number for a trail that has only existed in its current form for about 16 years. And with those numbers come challenges, specifically keeping it open and keeping it pristine. That work, much like the 20 years of work it took to plan and build the trail, largely falls to an army of passionate volunteers — a fact that is perhaps the most defining quality of the Rim Trail. Like many things, the Tahoe Rim Trail started as a dream. The man credited for the dream was Glen Hampton, a former U.S. Forest Service officer. As the story goes, Hampton envisioned the trail in 1977 while standing atop a peak. His goal: connect the peaks circling Lake Tahoe. Hampton spent several years hiking throughout the Tahoe Basin. During the process of identifying possible paths, he researched the routes of earlier travelers and inhabitants, including the Basque Shepherds and the Washoe people, according to the Tahoe Rim Trail Association, which officially formed in 1981. Construction started in 1984 and it would continue for years, with the initial 165-mile loop being completed in 2001. It took 10,000 volunteers, who gave more than 200,000 hours of time, to complete the trail, according to the association. While much of the effort in the early years was directed at construction, those involved became increasingly aware of just how important organizing and planning would be for long range sustainability. As Fessler succinctly summarized, it takes a ton of work to maintain the trail. Much of it depends on the season. As winter gives way to spring and snow starts to melt, crews start hitting the trail to assess conditions in order to relay information to the public. Brush and vegetation growing into the trail is removed — a process known as brushing. Chainsaws and crosscuts are hauled into the backcountry in order to free the trail of downed trees, which can number more than 300 over the course of winter. As summer settles in, the attention shifts to reconstruction and rehabilitation projects. For the summer of 2017, the association has two projects planned at both ends of the lake that focus on moving the trail off roads and onto single track. There are logistics behind all of this work. The trail passes through two states, one state park, six counties, three national forests and three designated wilderness areas. Those include the popular Desolation Wilderness area southwest of Lake Tahoe, as well as the Mt. Rose Wilderness to the north and the Granite Chief Wilderness west of the lake. Aside from manual work and planning, the Tahoe Rim Trail Association focuses on outreach — a critical component for ensuring responsible use of the trail. It offers a variety of workshops and programs aimed at getting young people outside and teaching users how to recreate sustainably. John and Diane McCall were shopping at an REI store in Berkeley in the mid ‘80s when, as Diane recalls, they saw a sign on a corkboard calling for volunteers to help build the Tahoe Rim Trail. It piqued the interest of the McCalls — who were living in Oakland at the time. What followed was three decades of varying involvement with the Rim Trail. “I love it,” John McCall, a Tahoe Rim Trail Association board member since the early 2000s, replied when asked why he continues to stay involved nearly 32 years since the couple first made the trip to Tahoe to volunteer. “It’s the greatest group of people,” Diane McCall added. The McCalls moved to Tahoe in 1999, and they are among the volunteers who have been involved with the Tahoe Rim Trail since practically the beginning, which has allowed them to see the trail and the association take shape over the decades. Since its early days the Tahoe Rim Trail Association has evolved from a more informal organization to a major player in the world of recreation in the Tahoe Basin. There are more employees, more donors and many, many volunteers who give a substantial amount of time. Annually more than 15,000 hours are selflessly given by more than 300 volunteers, according to the association. Those efforts include trail construction and maintenance, much of which is done on workdays that typically run from 9 a.m. to 4 p.m. Crew leaders, mainly volunteers with advanced technical instruction, instruct fellow volunteers on what they need to know about working on trails. “We invest heavily in technical and medical trainings for our volunteers to ensure the work that we take on is done correctly and in a safe manner,” Fessler said. It’s an incredibly rewarding experience to help build portions of trail, because at the end of the day you usually have to walk on the very trail that you spent a day building, stated John, who went through crew leader training in 2011 and says he can point to between 15 and 20 portions of trail that he helped build. Volunteers also assist in the association’s outreach efforts, guiding trips and planning other events that aim to build support, bring in new volunteers and further the association’s goal of preserving the Rim Trail for decades to come. The mere presence of such an organization itself is not unique. Trails such as the Pacific Crest and the Apalachian have similar nonprofit organizations that spearhead volunteer efforts. What helps set the Tahoe Rim Trail apart, though, is its relevance to the local community. John pointed out that the Tahoe Rim Trail has an advantage many other trails don’t have: Most of its members live within an hour of the trail, which helps when trying to mobilize volunteers. Still the McCalls and others involved with the Tahoe Rim Trail pointed to the volunteers and people involved when they talk about the trail.